Home News Insights US-EU data transfers: The fragile framework of the privacy shield? US-EU data transfers: The fragile framework of the privacy shield? In the latest issue of Risk & Compliance, Rimon’s Jill Williamson discusses the future of the new Privacy Shield framework for transferring data from the EU to the US, which was finalized in July 2016. "At its inception, the Privacy Shield had holes, and since the issuance of Executive Order 13768 on 25 January 2017, concerns about the viability of the Privacy Shield have grown,” she states. “There are a wide range of opinions on the impact of 13768, but one thing is clear: the only way to 'future-proof' your data protection programme is to understand the framework upon which the Privacy Shield is built." 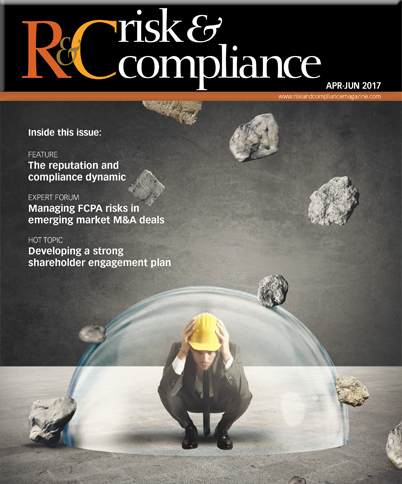 Subscribers to Risk & Compliance Magazine can read the full article in its Apr-Jun 2017 edition or clicking here. Ms. Williamson, a former Deputy Chief Compliance Officer at Cigna, holds over 15 years of experience both in-house and in private practice. Jill has represented companies and individuals in investigations before the Department of Treasury, Securities and Exchange Commission, Department of Treasury and Department of Commerce. She has led internal and government investigations around the globe. As Deputy Chief Compliance Officer at Cigna Corporation and Chief Compliance Officer at Liquidity Services, she built and managed global anti-corruption programs.